Changing your place of business is a high responsibility job that needs to be done quickly, efficiently and affordably. Moving your business or office from one place to another also needs to be safe and reliable. Our professional office removal service in London is the cost effective, highly efficient solution you have been looking for. Our teams of specially trained, qualified movers will be able to carry out the entire relocation safely, efficiently and within the shortest time possible. The removal teams are very experienced and will go about the whole process with unrivalled pace and efficiency. Office or commercial relocations are all about proper organisation and sound process management. When it comes to fast and easy London office removals, business customers can be sure that we will have everything under control and in check, during all stages of the removal. Being a professional and highly experienced moving company, we are well aware that office removals require sound planning, good timing, and efficient execution. With all these factors in place, customers can expect nothing but timely, cost effective completion without margin for error. We understand that there is too much at stake whendealing with office relocation projects, this is why we will visit your office or place of business well in advance of the actual moving date, for a preliminary job viewing. We will be able to assist you with all aspects of the move, if your next business location is not ready to accommodate you just yet, we can arrange for safe, affordable storage of your items for the time being. Our London office removal service is highly comprehensive and we will be able to handle the entire move from start to end. If your office is of substantial size or we need to move a large amount of items, we would like you to give us a sufficient prior notice so that we can arrange the packing, labelling and transportation accordingly. If necessary our people will disassemble office furniture for easier transportation, all pieces will be labelled or numbered and put back together. 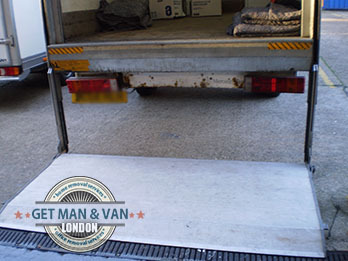 All vans and trucks our experts drive during office removals in London are supplied with the latest and most accurate GPS navigation system, as well as relevant loading and safety gear. We will handle your sensitive equipment with the due diligence and respect and make sure that not a single scratch is sustained by your goods while they are on the road with us. We guarantee to have your items delivered over to your new address safely and intact, as we work with seasoned, professional cargo drivers, which know their way around Greater London well. Cost wise, ourLondon office removal services are comfortably priced, and will give you the much needed cost efficiency, no matter how basic or elaborate your office moving requirements. Moving office during the work week is something which most businesses want to avoid and with us, they can do that. We have the most flexible office removals in London because they can be scheduled not only for a workday but also for weekends and bank holidays. In that way, your company won’t have to be stuck in amber during the relocation process. Our experienced movers will quickly execute the entire move and will meet even the tightest deadlines. You can use our stress-free office removal service in London even after regular business hours if that is the only available option for you. London is not only the capital of Britain, it is also the financial capital of the world. The City is the most economically active place on the planet, but the district of Canary Wharf in the borough of Tower Hamlets also distinguishes itself as a major player on the global market in the past couple of decades. London is also extremely popular with tourists – both English and foreign ones. Buckingham Palace and The London Eye are major attractions here. London is a great spot for any music lover. The city is filled with music venues and concert halls. Some of the most notable of them are the Royal Opera House and Royal Albert Hall. A number of music festivals are also organised in London such as British Summer Time.